I love that riff, the drums. Tight. The movie was not so bad, but I did have a crush on Jamie Gertz. Oh man. Bored? Got a Hamster? Got a few? 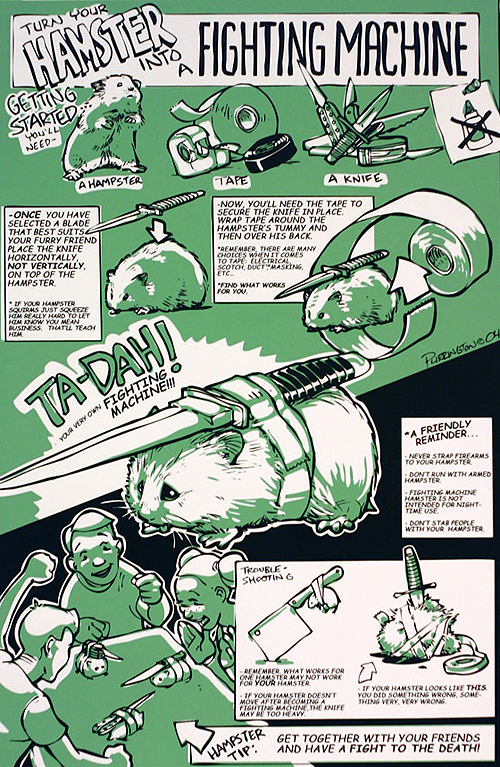 Have a non-ASPCA approved hamster fight! OH my god this ad is so awesome. I want a drink now, dammit. Stolen from the fine folks at Coudal. More fire info – here is a satellite photo with the fires keyed. Its even hotter out today. Damn. Here is a Flickr photo of the sunrise through the smoke. OK, its getting a bit surreal out here. Smoke still hangs in the air just about any direction you look (you get a good view from my roof). Fires are burning to the North, South and East of us. It turns the light a sort of purple color when the sun shines through these giant smoke clouds, and if one is close enough it rains ash onto everything. I feel for all the people out in the middle of the fires, as we are safely far away in the city. From the photos and news footage, it looks hellish. Here is a map of current fires. And a list with more description. Inspired by discussions about art versus non-art audiences in relation to my recent work, I made a proposal for a billboard. Let me know what you think. I went for a little 18 mile bike ride this weekend with my friend Mike. Rode right out of my building (literally) and over to the LA River by way of the new park in the Cornfields. We explored some tiny parks in Frogtown, and some places up in Atwater Village. If that means nothing to you, just look at the nice photos I took.